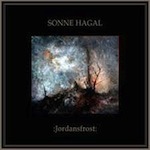 It’s been a good six years since Sonne Hagal’s last album, ‘Jordansfrost’ and I had long forgotten just how good this act was. ‘Ockerwasser’ opens up serenely with ‘The Shapes of Things to Come’; and subtitled (wait for it) ‘A Symphony of Sorrowful Songs, Like a Fresh Draught From the Font of Universal Life!’ it doesn’t take an numbskull to envisage the nature of the tracks on this release. Warm, inviting low-end male vocals, cascading pads and instrumentation, led with the gentle strumming of acoustic guitars; makes for some of the more quality driven Neo-Folk out there. Occasionally joined by other key artists within the genre, this trio deliver on every level, what they set out to achieve thematically. The poetic vocals hum like a chant across an autumn forest, breathing self-depreciation through an earthly vibration. Tracks, such as ‘Silence’ say more about this album lyrically, in one fell swoop; “I am the Silence, the Eye of the Storm, I am Nothing, I am all”. It is this simplicity that makes SH work so well as a complete outfit. Never overstating themselves, they have once again delivered the goods, through a concise and collective understanding of musicianship with ever the watchful eye on production quality. Apart from the odd delve into the “Hey Nonny Nonny” spectrum of folk music (which is to be expected I guess) ‘Ockerwasser’ is a solid, well constructed album that should appease their fans who have patiently waited a small age, for this to see the gloomy light of day.